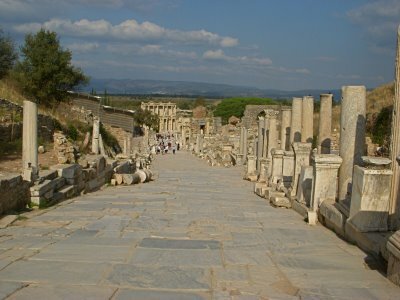 Selcuk is the town that the tourists stay to see Ephesus. Ephesus is only about three kilometers away from Selcuk. The Apostle Paul lived in Ephesus for three years. The story, also, explains that John and Mary the mother of Jesus lived in Ephesus. The tomb of John is just below the castle of Selcuk, and the house of Mary is perched on a hill. Although it seems kind of strange that Mary would live so far away from the town of Ephesus having to climb a hill to get home. Nevertheless, there is a good chance that John and Mary died here in Ephesus. 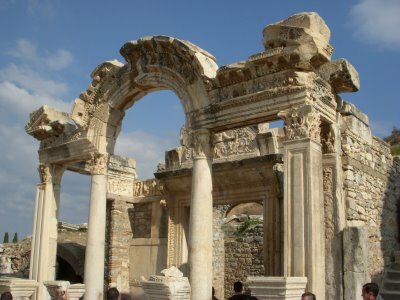 Ephesus is one of the top tourist attractions of Turkey, and the most crowded. Even so, Ephesus is well worth the visit, and if Ephesus is the first time a person is viewing ancient ruins, Ephesus can create the “Wow” expression. However, viewing a large amount of Roman sites, Ephesus adds to the mind of the expansive level of the Roman Empire. 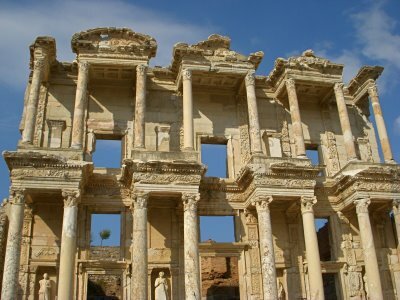 Ephesus is Roman City that is one of the best preserved in the Eastern Mediterranean. 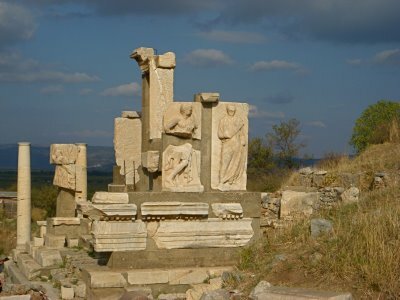 As you’re leaving the town of Selcuk the temple of Artemis was one of the seven ancient wonders of the world. Only one column remains, which looks like it was set up just for the tourist site. Nevertheless, this area can be viewed from the tomb of John. Originally, there were 127 columns to the temple. 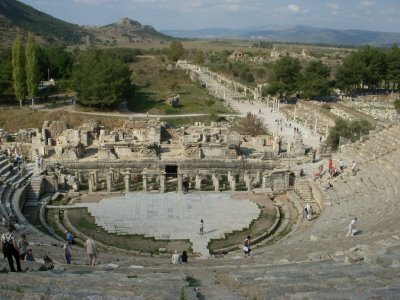 The main sites of Ephesus are the Library and the theater. In the summer the place must be packed and hot, although at the end of October the weather is nice, even though it was crowed with groups, it was much less crowded then during the summertime. Next post: The Temple of Apollo—Didyma.